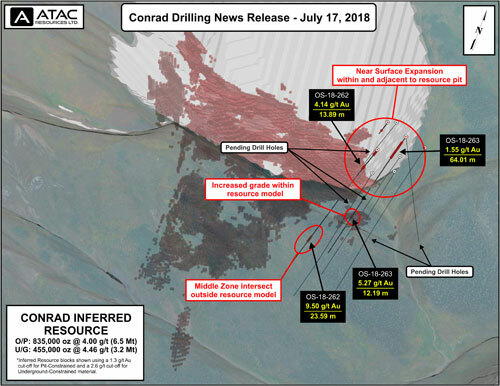 ATAC Resources Steps Out and Inters… | ATAC Resources Ltd.
July 17, 2018 - Vancouver, BC - ATAC Resources Ltd. (TSX-V:ATC) (“ATAC”) is pleased to announce results of the first three holes drilled from the Conrad Deposit step-out diamond drilling program within the Osiris Project, located at its Rackla Gold Property, Yukon. Expansion drilling continues at Conrad, which remains open in all directions. * Hole OS-18-261 abandoned short of target at 47.65 m due to drill-pad complications. ** The reported intersections are drilled thicknesses and are believed to represent approximately 50-80% true widths. *** Gram metres calculated by multiplying the interval by the g/t gold assay and rounded to the nearest integer. Drilling at the Conrad Deposit was initiated to expand upon ATAC’s recently announced maiden Mineral Resource. The initial 2018 phase of drilling targeted the 650-850 fault corridor where structurally controlled high-grade gold, associated with brittle faulting, was identified in a siliciclastic unit that returned values including 12.50 m of 20.78 g/t gold in OS-17-238. 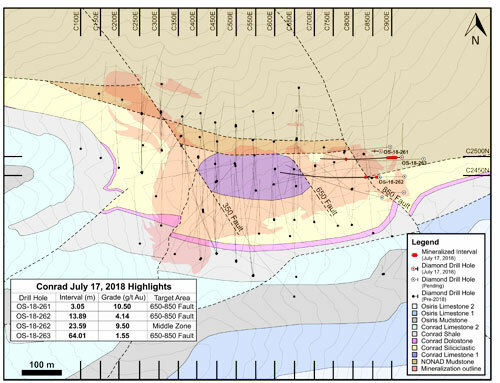 Hole OS-18-262 stepped out 40 m east of OS-17-238 and intersected two zones of near-surface gold mineralization associated with the 650-850 fault corridor. This hole intersected 18.29 m of 1.74 g/t gold starting at the bedrock surface, with an additional zone returning 13.89 m of 4.14 g/t gold from 66 metres down hole. High-grade, strata controlled limestone hosted mineralization was also intersected in OS-18-262 at depth and along strike from the Middle Zone, returning 23.59 m of 9.50 g/t gold (including 7.50 m of 22.87 g/t gold). This interval is located near the contact with the siliciclastic unit. All three intersections within OS-18-262 occurred outside the boundary of the Conrad Mineral Resource. Holes OS-18-261 and OS-18-263 stepped out 45 and 100 m east of OS-17-257, respectively. Both holes were drilled to test the eastward extension of near-surface mineralization intersected in OS-17-257 (12.19 m of 9.44 g/t gold) and OS-17-259 (25.91 m of 5.44 g/t gold). OS-18-261 intersected 3.05 m of 10.50 g/t before it was abandoned short at 47.65 m, short of its target, due to drill-pad complications. The target area of this hole has been re-drilled and results are pending. 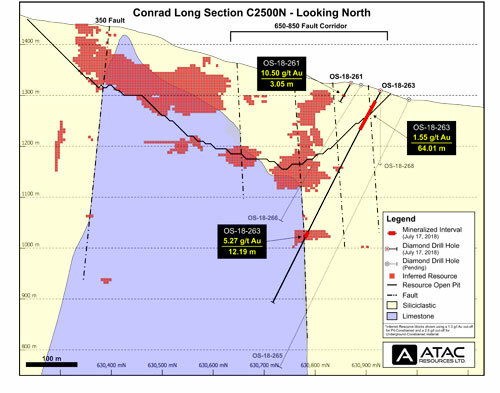 OS-18-263 intersected a broad zone returning 64.01 m of 1.55 g/t gold located 90 m to the east of the Conrad resource boundaries. This intersection is along trend of mineralization in holes OS-17-257, OS-17-259 and OS-18-261. The result confirms a continuous trend of near-surface mineralization that remains open on the eastern side of the Conrad Deposit. Hole OS-18-263 also intersected a deeper zone consisting of 12.19 m of 5.27 g/t gold within a fault bounded slice of limestone. Diamond drilling of the Conrad Deposit and the Sunrise Deposit is ongoing. 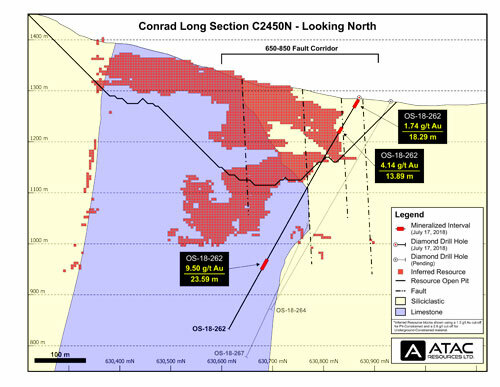 Please see ATAC’s website www.atacresources.com for updated Conrad Deposit figures. At the time of this release, approximately 3,800 m of diamond drilling has been completed at the Osiris Project. Additional results from the program will be released when available. Diamond drill samples were forwarded to ALS Minerals in Whitehorse, Y.T., where they were fine crushed before a 250 gram split was pulverized to better than 85% passing 75 microns. Pulps were then analyzed at ALS Minerals in North Vancouver, B.C. where gold determinations were carried out. Splits of the pulverized fraction were dissolved using a four acid digestion and analyzed for 49 elements using inductively coupled plasma (ICP) together with mass spectrometry (MS) and atomic emission spectroscopy (AES). Gold analyses were by the Au-AA25 procedure that involves fire assay preparation using a 30 gram charge with an atomic absorption spectroscopy (AAS) finish. Mercury analyses were digested with aqua regia and analyzed by inductively coupled plasma mass spectrometry (ICP-MS). Rigorous procedures are in place regarding sample collection, chain of custody and data entry. Certified assay standards, duplicate samples and blanks are routinely inserted into the sample stream of diamond drill samples to ensure integrity of the assay process. All diamond drill samples included in this news release have passed the QA/QC procedures as described above. ATAC is a Yukon-based exploration company focused on developing Canada’s only Carlin-type gold district at the Rackla Gold Property. Work on the ~1,700 km2 property has resulted in an Osiris Project Inferred Mineral Resource of 1,685,000 oz of gold at an average grade of 4.23 g/t (in 12.4 Mt) and a positive Preliminary Economic Assessment for the Tiger Gold Deposit. ATAC and Barrick have partnered to explore the Rackla Gold Property’s Orion Project, with Barrick having the option to earn up to 70% of Orion by spending $55 million in exploration. ATAC is well-financed with approximately $18 million in its treasury and is currently completing a $7 million exploration program at the Osiris and Rau Projects (which are not subject to Barrick’s earn-in right), while concurrently working with Barrick to advance the Orion Project.